Got an Apple, Mac or iOS tech question? We have the answer. 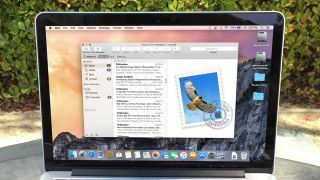 This time we have a reader who doesn't like the Favorites Bar in Apple Mail for Mac and wants to be rid of it. The Favorites Bar can be pretty useful, but depending on how you use your mail, it might not be for everybody, so we'll show you how to dump it if you want. I've just downloaded Yosemite and I pick up my gmail using Apple's Mail app. In the sidebar, it lists inbox, sent, etc. But then horizontally across the top, it reads mailboxes, inboxes, sent, etc. I want to get rid of that bar across the top next to mailboxes. I don't know why these are there since they duplicate what's down the sidebar. All it takes is one little command to hide the Favorites Bar in mail. To get the favorites bar back, simply repeat the above commands. There's no big advantage to hiding the favorites bar, but removing it means you'll be given more screen real estate (albeit a small amount) for message content.